Functional Medicine is an approach to medicine that supports the unique expression of health and vitality for each individual. In this way, a Functional Medicine workup can be beneficial for everyone. Our patients come to us from all walks of life—those suffering from chronic diseases, competitive athletes, young women, older men, children, and everyone in between. Functional Medicine clinicians spend a lot of time with their patients, listening to their histories and looking at the interactions among genetic, environmental, and lifestyle factors that can influence long-term health and complex, chronic disease. All symptoms and diseases have a cause(s). 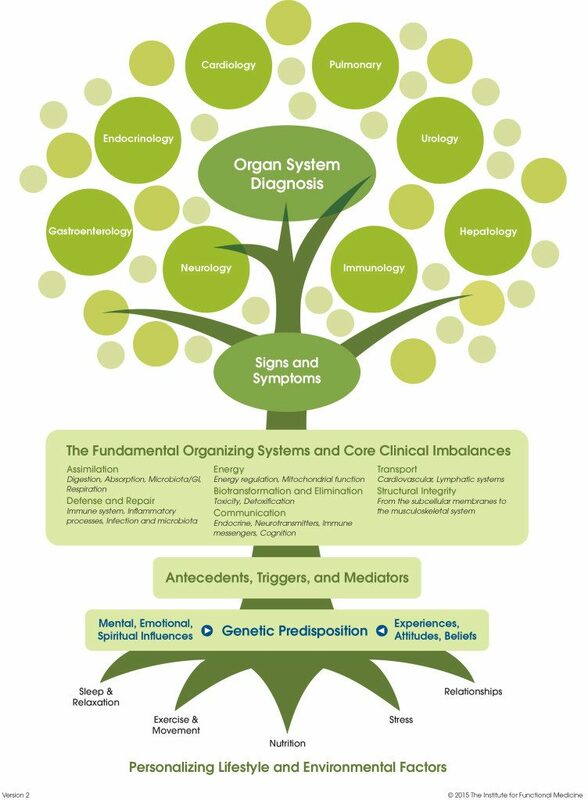 The Functional Medicine approach is designed to uncover and address the cause(s). Our team looks beyond your signs and symptoms to identify the fundamental imbalances in your body and what might be causing those imbalances. For this reason, Functional Medicine can be beneficial to anyone, whatever your diagnosis. We treat the following (and more): Acne, Alzheimer’s Disease and Dementia, Arthritis, Asthma, Autism, Spectrum Disorder, ADD, ADHD, Autoimmune Diseases, Cancer Prevention, Chronic, Fatigue, Chronic Sinusitis, Depression and Anxiety, Detoxification and Healing, Diabetes, Digestive Disorders (IBD, IBS, GERD/Reflux), Eczema/Psoriasis, Elevated Cholesterol, Environmental and Food Allergies, Fatigue, Female Disorders (PMS, Menopause, Infertility, PCOS), Fibromyalgia, Fluoroquinolone Toxicity, Healthy Aging, Healthy Weight and Metabolism, Heart Health, Hormone Balance, Interstitial Cystitis, Low Testosterone, Mercury and Heavy Metal Toxicity, Metabolic Syndrome, Pre-Diabetes, Insulin Resistance, Migraines and Headaches, Multiple Sclerosis, Obesity, Osteoporosis, Parkinson’s Disease, Restless Leg Syndrome, Sleep/Insomnia, Thyroid and Adrenal Disorders.